Meet Prince - and he is a real charmer! One of the latest stars at Daesdaemar. 9 Baby in Groups and 2 Baby in Show wins! 10 Minor Puppy in Groups and 1 Minor in Show award! 12 Best Puppy in Group and 2 Best Puppy in Shows including Sydney Kennel Club! 11 Junior in Groups wins and 4 Best Junior in Show awards - including the Inaugural Japanese Spitz Championship Show and the prestigious Sydney Kennel Club International Show! Best of Breed at Canberra Royal 2012. Best Junior in Show at the Inaugral Japanese Spitz Club of NSW Specialty Sept 2012. At 18 months of age Prince finished his campaign in the Rising Star competition - finishing at Number 4 Non Sporting Rising Star in NSW. Prince was Best of Breed at the 2013 Sydney Royal Easter Show and was shortlisted in the final 8 in the Best in Group lineup!! BEST EXHIBIT IN SHOW at the Spitz Breeds Dog Club of NSW, October 2013!! Prince achieves his Grand Championship in fine style with a Best Exhibit in Group win, November 2013!! After a short break from the ring, Prince returns in March 2014 with an All Breeds Runner up Best Exhibit in Show!! Dog Challenge and R/up BOB - 2014 Sydney Royal Easter Show! Reserve Dog Challenge - 2014 Japanese Spitz Club of NSW Spring Fair Specialty. Prince continues to do well in the older classes - 9 Best Exhibit and 14 Runner up Best in Group wins. plus.......so far 35 Intermediate/Aust Bred in group wins and 4 Intermediate in show wins. He is a conistent Best of Breed winner and has achieved many of these wins competing against his beautiful father, Supreme Champion Daesdaemar New Moon. 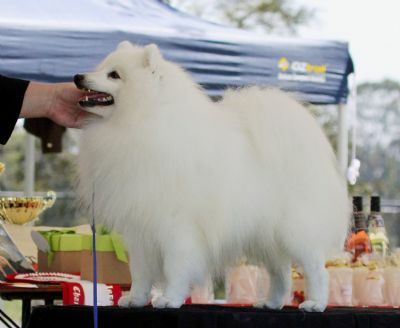 He was Number 1 Japanese Spitz in Australia in 2013 and 2014! Just like his beautiful father, Prince has a wonderful temperament and exudes confidence and showmanship. Prince is a real pleasure to show! Prince achieves his Supreme title in September with his Best in Group at Hunter KC!! The 3rd Supreme Champion for Daesdaemar!!! 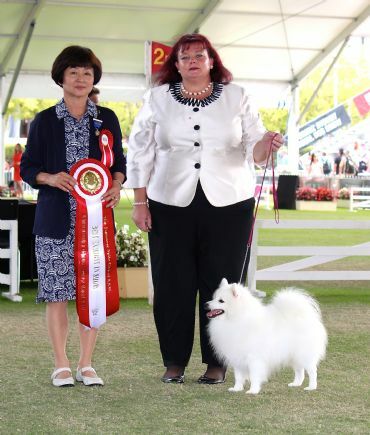 Easter 2015 - Prince is awarder Best Exhibit in Show at the Japanese Spitz Club of NSW Easter specialty!! Judge was breed specialist Mrs S Ideka of Japan!! !